WineAmerica and Winegrape Growers of America are reuniting to produce the 2015 Wine and Grape Policy Conference, April 12-14, 2015. The conference features a revised format to maximize learning, advocacy and networking in a setting only minutes away from Capitol Hill and our nation’s key regulatory agencies. Winegrowing from grape to glass is heavily regulated. This meeting is the industries opportunity to make its voice heard. This two-and-half day conference will feature speakers, presentations and insights on the politics and policies affecting our industry. A meeting of the WineAmerica Board of Directors and the State and Regional Association Advisory Council will be included in the agenda. The conference will culminate with the annual “Wines of America” reception. Held in the House of Representatives Office Building, in concert with the Wine Caucus, this tasting demonstrates the importance of the American wine industry by featuring wine from over twenty states. 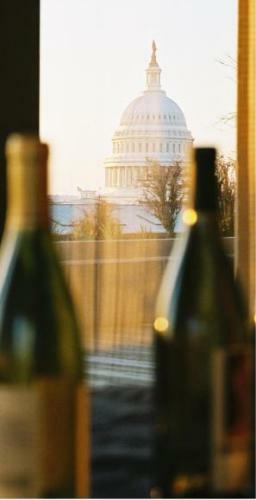 This reception is your opportunity to introduce your wine to your member of Congress. The 2015 Wine and Grape Policy Conference is your opportunities to make a difference about the laws that affect you. REGISTRATION & SPONSORSHIP: To register or to sponsor the conference, click here. Deadline to reserve a room through the room block is Friday, March 13, 2015. Hotel rooms fill up fast. Please make your hotel reservations before this date! For hotel reservations, please call the Holiday Inn Capitol 877-572-6951 and reference booking code WG8. For online reservations, please click here. Hotel Accommodations are being held at the Holiday Inn Capitol for the Winegrape Growers of America for check-in beginning Saturday, April 11, check-out Thursday, April 16. Rate is $259.00 per night. This rate does not include DC sales tax, currently 14.5%. Credit card information is needed at time of reservation. Individual cancellation policy is 72 hours prior to date of arrival to avoid one night’s room plus tax cancellation charge on credit card provided. Please call 1-877-572-6951 and reference your confirmation number. Please obtain a cancellation number when cancelling a reservation. Session Description: Get a look into the current political environment in Washington DC with an overview and perspective from both the Republican and Democratic side of the aisle. Session Description: Our nation’s immigration system is broken and in dire need of reform. Despite the noise and fury surrounding the issue it appears little will happen this year on Capitol Hill. With Republicans in control and prospective presidential candidates jockeying for position ahead of the presidential primaries, this session will explore why Washington remains gridlocked and what needs to happen for comprehensive immigration reform to pass. Session Description: From label approval delays to permit applications slowdowns, TTB has recently not been able to keep up with the needs and growth of the alcohol industry. The main roadblock has been a lack of adequate appropriations. How has this hurt the three main alcohol industries and what can be done to help TTB become a more responsive regulatory agency? Session Description: Groups opposing the presence of genetically engineered (GE) content in food and beverages have waged an active campaign in states and cities throughout the United States to ban the production of GE commodities or require disclosure of GE content on food labels. The House Agriculture Committee and other congressional leaders want to preempt states and maintain federal authority over food and beverage labeling laws. Who will win in this showdown between federal preemption and states’ rights? This session will examine the current debate on Capitol Hill. Session Description: While enjoying breakfast, hear from the bipartisan leaders of the Congressional Wine Caucus about the current standing of wine and vineyard related issues on the Hill. Session Description: The United States Mandatory Country of Origin Labeling (COOL) rules require most retailers to provide consumers with the origin of fresh fruits and vegetables, fish, shellfish, peanuts, pecans, macadamia nuts, ginseng, meat and poultry. The rules are stipulated in the 2002 Farm Bill as amended by the 2008 Farm Bill. Less than one year after the COOL rules took effect, both Canada and Mexico challenged the rule for muscle cuts of meat at the World Trade Organization (WTO), arguing that COOL gives the U.S. an unfair advantage by reducing the value and number of cattle and hogs shipped to the U.S. market. The WTO compliance panel report again found the U.S. to be in noncompliance with its international trade obligations. In fact, it found the revised rule was even more discriminatory than the earlier version. Canada has threatened retaliatory tariffs on U.S. wine if a statutory change is not implemented. Hear an update on the progress of this issue and the impact on the industry. Tax Return & Budget Reform10:30 AM – 11:30 AMSession Description: A Republican Congress and a Democratic President each want tax reform, but differ on goals and outcomes. Can they overcome their differences and reform a tax code? If tax reform efforts takeoff, who stands to win and who loses? How will the three current alcohol related tax bills play out? Session Description: Increasingly, retailers are asking suppliers to quantify and document the sustainability of a wide variety of consumer goods and their related supply chains. Retailers, like WalMart/Sam’s Club and Whole Foods, are taking aggressive steps to push sustainability through their supply chains. This session will explore how retailers are using sustainability as a tool in category management and product marketing, and the potential regulatory implications of sustainability claims in the consumer marketplace.